Rev Coil Corrosion | Air Conditioning | Heating | HVAC | Modesto, CA 95351 | Bailey's Heating & Air, Inc.
You may have already read my earlier paper on formicary corrosion. I have written the following to help further explain the failures that are increasingly costing all consumers money and eroding your confidence in our ability to provide equipment that is trouble-free. After all, as our customers, you have placed your trust in us and spent thousands of dollars- who wouldn’t want an explanation? Our experience and those of many other contractors around the country show a 20:1 ratio of failed R410a coils to R22 coils. If the corrosion/leaks are due to off-gassed volatile organic compounds and other chemicals in the air adhering to the coil, as the manufacturers claim, then this begs the question: what changed in the air? Given that there is no reason for homes with R410a coils to have air different than that of homes with R22 coils, the failure ratio ought be 1:1 or, at most, 2:1. Furthermore, corrosion takes time, and yet here again we find another red flag: corrosion appears to be accelerated in R410a coils, with the average age of failing R22 coils over ten years, but the average age of failing R410a coils four years or less. Those two facts alone should have prompted additional research, but the manufacturers stopped as soon as they saw what they wanted to see. That is the discovery of chemicals in the air in your home was landing on the coil. Now, make no mistake- air in the home certainly contributes to the problem, as without those gases, chemicals, and compounds adhering to the coil, corrosion would not occur. Remove the moisture from the equation and, again, you would stop the corrosion. But there is more to consider, such as the aforementioned time factor and disparity of the quantity between leaking R22 and R410a coils. Addressing these issues leads us on a very different track. There are several significant differences between R22 and R410a coils: 1) lubricant, 2) copper wall thickness, 3) velocity, 4) pressure, 5) rifling and 6) refrigerant itself. Both refrigerants employ lubricant, and research has shown that any time fluids are flowing through tubing or pipes, a static charge can be generated. This phenomenon is known as flow electrification. We believe this charge contributes to an anode/cathode reaction between the copper tubing and the aluminum fins, with condensation on the coil completing the process and thus causing copper to be removed at an accelerated rate. And while both R22 and R410 coils use lubricant, they do not use the same lubricant: R22 uses mineral oil as its lubricant, while R410a uses Poly-Oly-Ester Oil (POE). I believe the properties of the POE oil (mainly because it is a synthetic, while mineral oil is not) create flow electrification and a static charge that is dissipating along where the fins are affixed to the copper. Add in surface compounds and moisture and we find corrosion at a much more accelerated rate than that of an R22 coil. To make matters worse, the copper in R410a coils has been manufactured with thinner walls than the old R22 coils, in an effort to get better heat transfer. Similarly, R410a coils are riffled like a gun barrel in order to increase surface area (and thus give, again, better heat transfer). This rifling and increased surface area may also be contributing to generation of electrostatic charge. 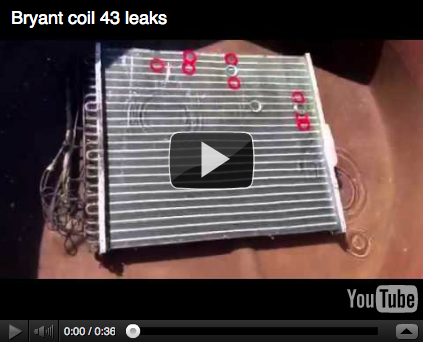 To reiterate, we know the R22 coils are corroding the same as the R410a coils, only at a much slower natural rate. The R22 coils will develop leaks over time the same as R410a coils- it’s just that it takes an R22 coil decades, rather than months. One might ask, then, why some customers experience leaks while others do not; we have seen this causally linked to how often the equipment is ran. After speaking with several customers with failed coils, I have found that almost all these customers run their equipment more frequently or continuously than those without leaks. 1) Change over to all-aluminum. 2) Stop the flow electrification by using additives or changing the properties of the oil. 3) Coat the coils at the factory. 4) Go back to R22. Recently, I was contacted by a major manufacturer of copper tubing and copper fittings, who is considering producing copper tubing that is coated (I am sure they are afraid the industry will choose option one and switch over to aluminum only). I was glad they wanted my opinion of whether I thought the coating would work, but also surprised- the industry itself should be addressing this, not an ordinary HVAC contractor. Yes, I have dug deeper into this issue than most and been very vocal about it, but only because I refuse to accept an explanation that doesn’t make any sense. If the manufacturers would step up to the plate, this would not have fallen to my shoulders. You, as the consumer, should be mad as hell at the lack of action by the manufacturers. I hope that this page helps you make an informed decision when it comes time to replace your system.